Are you dealing with a dog who is suffering from painful, maybe life-threatening health issues? Maybe your pit bull has such intense anxiety that she cowers during every thunderstorm, or your twelve-year-old schnauzer is struggling to walk from arthritic joints. Maybe you’ve got a rescue Golden Retriever with cancer. Or a Corgi who suffers with seizures. While there are a growing number of natural health options available for canine health conditions, many either don’t work or have nasty side effects. … And as a result it’s increasing in popularity across the country. And becoming difficult to keep in stock. But what is CBD oil, and what health benefits can it offer your pet? Let’s look at the facts. Cannabinol (CBD) is one of over 85 compounds collectively known as cannabinoids that are found in the cannabis plant. [ii] CBD alone makes up close to 40 percent of the plant’s extracts, [iii] but it’s not what’s responsible for cannabis’s most famous properties. Instead, a cannabinoid called THC (tetrahydrocannabinol) is what actually produces the “high” that everyone associates with pot. It takes a specialized CO2 extraction process to get a concentrated CBD oil from cannabis plants. However, it’s worth as the resulting liquid is rich in amino acids, omega-3 fatty acids, terpenes, and other beneficial compounds. Why is CBD oil so special? It’s the cannabinoids it contains. Cannabinoids work by attaching themselves to your body through either CB1 or CB2 receptors. CB1 receptors are primarily linked to the brain, and they control coordination, cognition, mood, memory formation, and even appetite. CBD, on the other hand, only affects the CB2 receptors. These are directly connected to the immune system, and they are responsible for managing pain and inflammation. And evidence shows that they stimulate your system to build its own receptors instead. [vi] So no matter what, if your immune system has been compromised, you can supplement your levels with CBD oil to make up the difference. Plus, it’s not a sedative that “masks” the underlying health problem by merely temporarily hiding your symptoms. Instead, cannabinol triggers the immune system in ways that improve, even reverse, non-normal functioning. Contrary to popular opinion, marijuana and hemp are not the same. Both plants share the common ancestor of cannabis sativa, but centuries of selective breeding that focused on different characteristics has led to the development of two plants with significantly different ratios of cannabinoids. To be classified as hemp, a cannabis plant can’t contain more than a 0.3 percent THC concentration. As THC is the coveted compound in pot plants, most marijuana varieties include upwards of 15 to 20 percent. [xi] Despite the amount of THC in the final product, it is classified as hemp or marijuana based on its plant of origin. How legal is CBD oil in the United States today? That answer isn’t as clear as it could be, as regulations change depending on where you live and whether the compound comes from industrial hemp or marijuana plants. CBD oil derived from industrial hemp is legal across the country. Marijuana runs the full spectrum from being entirely legal in some states, permitted only for medical use in others, and being banned entirely in the rest. Likewise, many states permit people to grow “industrial hemp” while others forbid its production but allow it to be imported if grown elsewhere. There is some debate about whether the effectiveness of CBD oil changes if it’s derived from hemp or marijuana. Some people find THC improves their symptom relief from CBD. However, this isn’t a factor you should consider for your pet. Will CBD Oil Get Your Dog “High”? 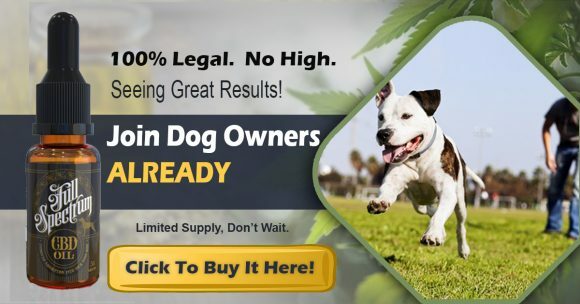 You might have seen CBD oil showing up in a variety of dog-related products, from oils and capsules to specially formulated dog biscuits. Yet, many dog owners are leery of serving their pets a dose of cannabinoids. Will using CBD oil make your dog high? The odds are virtually zero. THC highs are dangerous for dogs, so canine-grade CBD oils should always come from hemp. [xii] CBD oil can provide your pet with a calming feeling and reduce chronic pain, but it its lack of psychoactive qualities means that it won’t create a “high” or affect them mentally. Will CBD oil improve the health of your pet? The evidence seems to show so. Some of the conditions that the compound can address include the following. If your dog regularly lunges on a leash or cowers under the bed when a stranger comes in, CBD oil might reduce that anxiety so that he can develop new patterns of behavior. Likewise, CBD oil can improve the quality of life for dogs that deal with anxiety when their owners leave, helping to prevent them from indulging in destructive behaviors like chewing, pacing, urinating, and more. According to CBD World,[xiii] one reviewer’s dog had cancer and severe storm anxiety for his entire life. This stress triggered vomiting, which made it hard for the dog to eat enough to keep his weight within a healthy range. Regular doses of a CBD oil tincture improved his sleep and helped him keep down food. After a few weeks of treatment, his general anxiety was almost gone, and the dog was able to maintain a healthier weight because of it. Suffering from seizures is a struggle for both pets and their owners, but CBD oil is proven to make a difference. The compound has been found to be a practical treatment option for managing seizures in humans as they are experiencing them, and it can reduce their frequency over time. If your pup hasn’t responded well to standard seizure medication, consider treating them with Full Spectrum CBD Oil for Dogs instead. It’s extremely common for older dogs to develop arthritis in their joints. Dogs lose their appetites for numerous reasons, but the issue is often linked to nausea. You can improve your pet’s desire to eat by giving her CBD oil to eliminate any digestive distress. 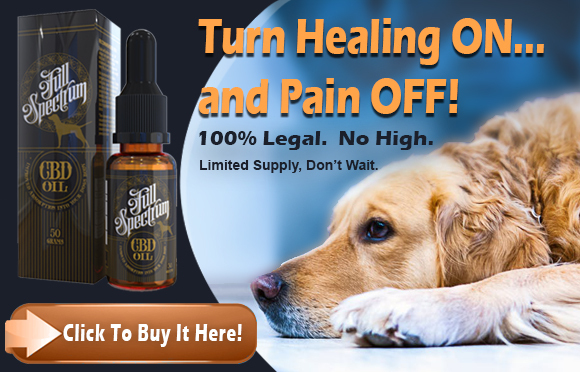 [xxiii] Likewise, the National Cancer Institute states that CBD oil can increase appetite,[xxiv] making it a smart way to get a stubborn dog to touch his food again. Part of the benefit comes from its ability to suppress the formation of Th17 dominance, a significant cause of autoimmune diseases. [xxxv] The compound is also a powerful antioxidant (more potent than vitamins C and E),[xxxvi] and it can reduce cases of chronic inflammation for your dog. CBD oil might be good for the canine heart. Research has shown that the compound can reduce damage to blood vessels, even out irregular heart rates, and reduce blood pressure problems associated with stress and anxiety. [xxxviii] [xxxix]In other words, taking CBD oil supplements can keep your pet’s heart ticking as it should. For those looking for a natural alternative to prescription pet medications, CBD oil holds much promise. Our Full Spectrum CBD Oil For Dogs is organic, sourced from industrial hemp (so legal), pesticide free and solvent free. However, please note that high global demand for CBD oil means there have been shortages in North America and we anticipate that our stock may sell out quickly. 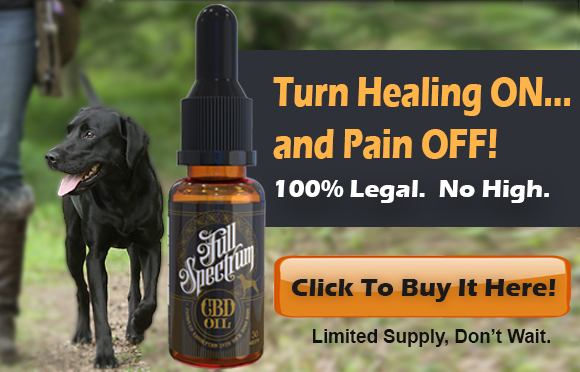 If you’re interested in trying CBD oil with your dog, click here now to get complete details. [vii] Role of the endocannabinoid system in vertebrates: Emphasis on the zebrafish model. [xi] Hempmedspx: Which States is CBD Oil Legal to Purchase? [xviii] The Guardian: Pets on pot: is medical marijuana giving sick animals a necessary dose of relief? [xix] Medical News Today: Can CBD oil relieve arthritis pain? [xxiii] Cannabidiol, a non-psychotropic component of cannabis, attenuates vomiting and nausea-like behaviour via indirect agonism of 5-HT(1A) somatodendritic autoreceptors in the dorsal raphe nucleus. [xxix] Cannabinoids increase lung cancer cell lysis by lymphokine-activated killer cells via upregulation of ICAM-1. [xxxi] The Guardian: Pets on pot: is medical marijuana giving sick animals a necessary dose of relief? [xxxiii] Antibacterial cannabinoids from Cannabis sativa: a structure-activity study. [xxxiv] Cannabinoids in intestinal inflammation and cancer. [xxxv] Cannabinoids decrease the th17 inflammatory autoimmune phenotype. [xxxvii] Cannabidiol for neurodegenerative disorders: important new clinical applications for this phytocannabinoid?